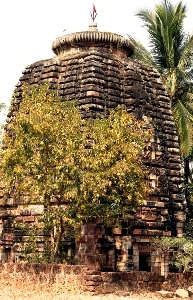 Swarnajaleswar Temple One of the old temples of odisha, the Swarnjaleswar temple bears close architectural affinity to the Parsurameswar temple.It stands on the road from the Lingaraj to the Kedargouri temple and was in a utterly ruined condition, but the structure is being restored now. It bears on the lintel of its northern niche a scene of Lord Siva's marraige, which can be regarded as a replica of the same scene carved on the lintel of the eastern niche of the Parsurameswar. The Swarnajaleswar Temple like all the early temples also bears several scenes from Ramayana & The Mahabharata in a sunken panel running round the Vimana and making the transition between the Vada and the Sikhara.